Objectives Effective oral therapies for hepatitis B and C have recently been developed, while there are no approved pharmacological therapies for alcoholic and non-alcoholic fatty liver diseases (ALD and NAFLD). We hypothesise that fewer advances in fatty liver diseases could be related to disparities in research attention. Methods We developed the Attention-to-Burden Index (ABI) that compares the research activities during 2010–2014, and an estimate of disease burden of these 4 major liver diseases. The resulting ratio reflects either overattention (positive value) or inadequate attention (negative value) compared with disease burden. The mean research attention and disease burden were calculated from 5 and 6 different parameters, respectively. The efficacy rate of current pharmacological therapies was assessed from published clinical trials. Findings The mean research attention for hepatitis B and C was 31% and 47%, respectively, while NAFLD and ALD received 17% and 5%. The overall burden was 5% and 28% for hepatitis B and C, and 17% and 50% for NAFLD and ALD. The calculated ABI for hepatitis B and C revealed a +6.7-fold and +1.7-fold overattention, respectively. NAFLD received an appropriate attention compared with its burden, while ALD received marked inadequate attention of −9.7-fold. The efficacy rate of current pharmacological agents was 72% for hepatitis B, 89% for hepatitis C, 25% for non-alcoholic steatohepatitis and 13% for alcoholic hepatitis. Importantly, we found a positive correlation between the mean attention and the efficacy rate of current therapies in these 4 major liver diseases. Interpretation There are important disparities between research attention and disease burden among the major liver diseases. While viral hepatitis has received considerable attention, there is a marked inadequate attention to ALD. There is a critical need to increase awareness of ALD in the liver research community. This is the first comprehensive systematic study assessing the relative attention to the major liver diseases. This study develops a novel tool to estimate the ratio between the research attention and burden of major liver disease (ie, the Attention-to-Burden Index or ABI). We found a strong correlation between the efficacy of current pharmacological therapies and the degree of research attention devoted to each major liver disease, which strongly suggests the need to reallocate more research resources to alcoholic liver disease. The global burden of the major liver disease is largely unknown and we used an array of different variables. The efficacy of pharmacological therapies for viral hepatitis can be easily calculated based on viral parameters, while the parameters to evaluate the resolution of fatty liver diseases are not well established. Major advances have been made in the management of viral hepatitis, such as vaccines and oral therapies for HBV, and oral regimes for HCV.8 ,9 In the past decade, there has been an increased focus on NAFLD, with studies identifying targeted therapies and subsequent clinical trials.10 ,11 In comparison to the advances, ALD has been afforded scant attention, with few advances in its management.12 Patients with ALD are mostly identified at late stages of the disease, and programmes for early detection are scarce. Moreover, the genetic and environmental factors are largely unknown. 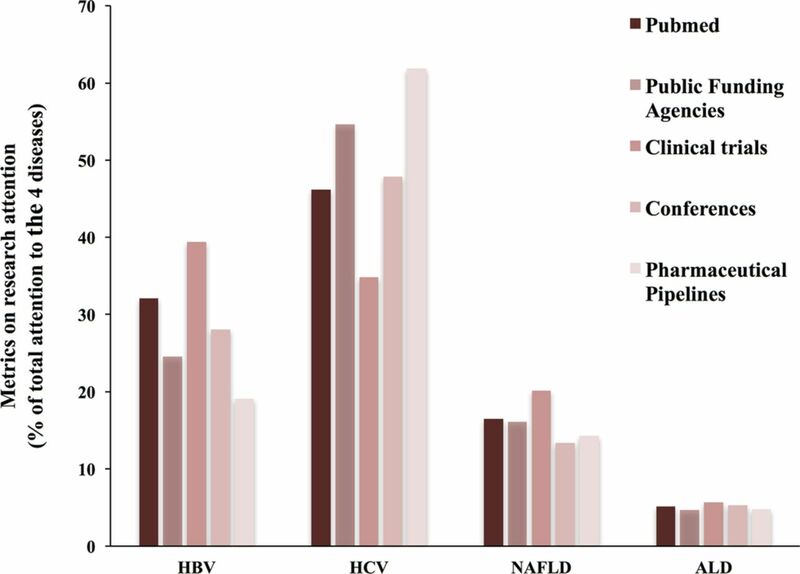 We hypothesised that differences in advancement between viral hepatitis and fatty liver diseases, in particular ALD, are related to varying allocations of research resources. There are no systematic studies assessing the relative research on different aetiologies of liver disease, or how commensurate research attention is with disease burden. The current study was undertaken to fill this gap. For this systematic analysis, data on the research attention were obtained at multiple levels for the four main liver disease aetiologies, carried out during the years 2010–2014, and analysed during 2015. 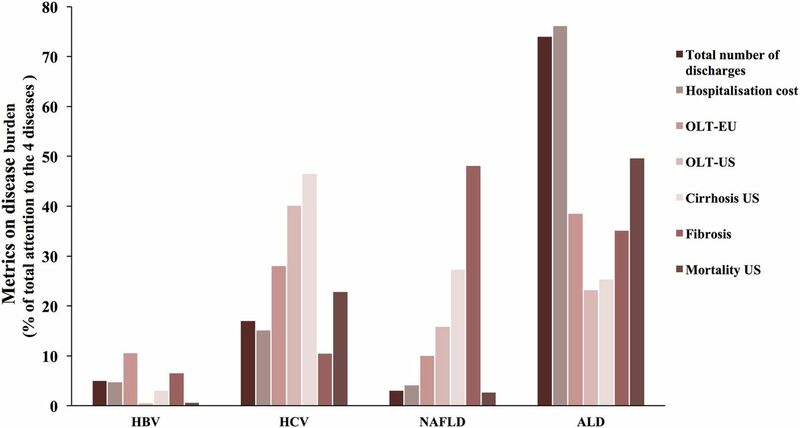 The aetiologies categorised were HCV, HBV, NAFLD and ALD, while data on less prevalent liver diseases were considered but not included in the final analysis. A quantitative scoring system was used to define and subsequently measure research attention to liver disease aetiology. When a single cause of liver disease was identified in a presentation, grant, clinical trial or scientific publication, full points (1.0 point) were allocated to the disease. When two causes of liver disease were identified, points were equally shared (0.5 point each). When the focus of a study could be attributed to more than two causes of liver disease or the study investigated a common mechanism (eg, hepatocellular apoptosis) and/or consequence of liver diseases (eg, ascites), the finding was excluded. Basic science studies that investigated common mechanisms of liver disease were also excluded. The relative level of attention to each liver disease was calculated at five different levels: primary research presented at major scientific liver meetings, drugs in development, research opportunities, clinical trials and publications. The mean research attention was calculated by averaging the relative level of attention devoted to each liver disease in each of the five categories. The scoring system for the two major global liver scientific meetings (American Association Study of Liver Diseases (AASLD) and European Association for the Study of the Liver (EASL)) was designed to reflect the quantity of presentations as well as the level of presentation. The scores were allocated as follows: 5 points, title of a large symposium (eg, postgraduate course); 4 points, title of small courses or joint workshops; 3 points, scientific presentations at an oral general meeting or plenary session, presidential lectures or state-of-the-art lectures and titles of parallel session; 2 points, scientific presentations at a parallel session, early morning workshops, meet-the-professor luncheon or grand rounds and titles from sections of the poster presentations; and 1 point, scientific presentation as a poster. The number of abstracts in each category was multiplied by the allocated score to provide an overall weighted research attention. Only clinical and translational studies including human samples were included. Scores for attention are reported as a percentage or total N.
A systematic online search of the 38 major pharmaceutical companies was made to determine the amount of pharmacological therapies in development for the four major liver diseases. Drugs in development that were specifically indicated for one of the four liver diseases were included in the analysis. The National Institutes of Health (NIH) Research Portfolio Reporting Tools (RePORTER) was accessed to identify public funding opportunities in the USA. The following Boolean searches were performed using these terms: ‘alcoholic liver disease’ excluding ‘non-alcoholic fatty liver disease’, ‘hepatitis C virus’, ‘hepatitis B virus’, ‘nonalcoholic fatty liver disease’ excluding ‘alcoholic liver disease’. To identify public grant opportunities for the European Union (EU), the Community Research and Development Information Service (CORDIS) advanced search database was used, and the ‘Only Projects’ tab was selected and the same search items were entered. The number of corresponding grants was recorded by disease category. The same search terms used for the research opportunities section were entered into Clinicaltrials.gov and PubMed to identify ongoing clinical trials and publications, respectively. Observational and interventional ongoing studies for the four major liver diseases were identified. Trials and/or publications on unspecific liver diseases (ie, cirrhosis) were excluded. We conducted a systematic review of the main controlled clinical trials testing targeted therapies for viral hepatitis and fatty liver diseases. Studies published during the period 2010–2014 in the most cited journals were included and reviewed. For HBV, the cure rate was determined by DNA clearance or persistent reduction of Hepatitis B Surface Antigen (HBsAg). For HCV, we considered the sustained viral response (SVR) at 12 weeks to help determine drug efficacies. In patients with biopsy-proven non-alcoholic steatohepatitis (NASH), we defined drug efficacy as histological improvement of patients in the NAFLD Activity Score (NAS) score and/or fibrosis. Regarding ALD, in the absence of consistent studies in patients with early disease, rates of efficacy were based on 28-day survival in patients with alcoholic hepatitis (AH). The Attention-to-Burden Index (ABI) was developed to compare the research activities during 2010–2014, and an estimate of disease burden of the four major liver diseases. The ABI for each liver disease was calculated as the mean research attention divided by the mean disease burden for each liver disease. A resulting ratio close to 1 reflects an appropriate attention compared with the burden. In contrast, ABI reflects either overattention (positive value) or inadequate attention (negative value) compared with the burden. Descriptive data are reported for liver meeting attention, drug development attention, published article attention, clinical trial attention, research grant attention and burden of disease as either N or per cent where appropriate. Ratios were created comparing the proportion of disease attention and proportion of disease burden. SPSS software (Chapel Hill, North Carolina, USA) was used to determine the Pearson's correlation between drug efficacy and research attention to the four main liver diseases. An analysis of variance test was also carried out to determine the level of significance of the correlation between research attention and pharmaceutical drug efficacy. We first performed a systematic analysis of the research attention paid to the four main liver diseases during the period 2010–2014 at five different levels. EASL meetings had a research attention of 55% and 25% for HCV and HBV, respectively, while NAFLD and ALD received 13% and 7%, respectively. 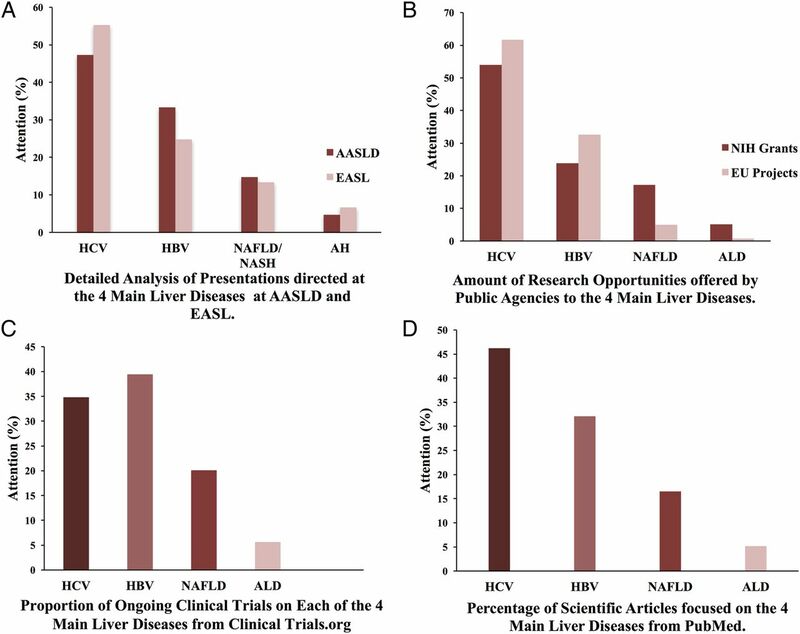 AASLD meetings provided similar research focus to HCV and HBV (attentions of 49% and 32%, respectively) while NAFLD and ALD received 14% and 4% (figure 1A, table 1 and online supplementary table S1). Parameters of research attention to the four major liver diseases. The relative level of attention devoted to each liver disease from different parameters: (A) detailed analysis of all presentations at the two major annual scientific liver meetings (AASLD and EASL); (B) research opportunities offered by public agencies in the USA and in the EU; (C) ongoing registered clinical trials (ClinicalTrials.gov); (D) scientific publications (PubMed). AASLD, American Association Study of Liver Diseases; AH, alcoholic hepatitis; ALD, alcoholic liver disease; EASL, European Association for the Study of the Liver; EU, European Union; HBV, hepatitis B virus; HCV, hepatitis C virus; NAFLD, non-alcoholic fatty liver disease; NASH, non-alcoholic steatohepatitis; NIH, National Institutes of Health. In the analysis of drugs in the pipeline from the main 38 drug companies, we found 74 drugs specifically indicated to treat these four major liver diseases. Eighty-two per cent of such drugs were for HCV, mainly oral-acting interferon-free regimes. 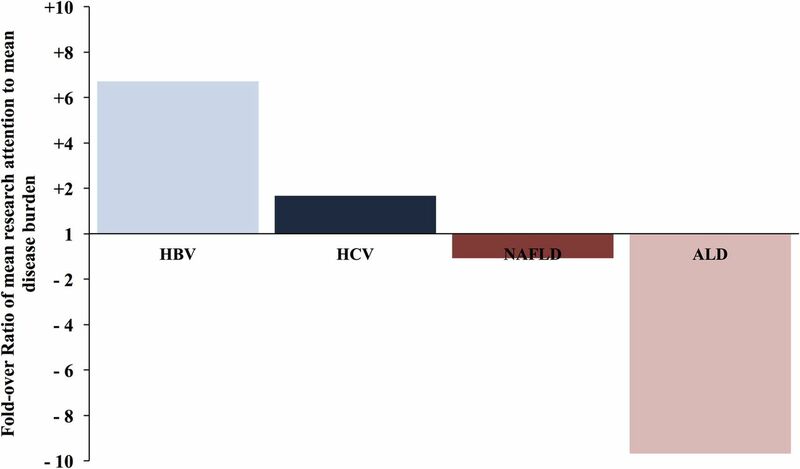 A smaller proportion of drugs were devoted to HBV (12%), while only 6% of the drugs in development were focused on treating either NAFLD (3%) or ALD (3%; see online supplementary table S2). Next, research opportunities were assessed in public agencies in the USA and the EU (see online supplementary table S3). In the USA and the EU, it was found that the majority of funding opportunities were devoted to HCV (48% and 61%, respectively), followed by HBV (21% and 30%; figure 1B). In contrast, NAFLD received less attention (20% in the USA and 7% in the EU) while ALD received minimal funding opportunities (3% in the USA and 0% in the EU). Next, registered clinical trials were analysed to determine the proportion of focus devoted to the four main liver diseases. A total of 1273 clinical trials were found, and most studies were devoted to test anti-HCV and HBV drugs (32% and 36%, respectively; figure 1C). The proportion of ongoing trials for NAFLD was 5%, while 18% of ongoing trials were specifically devoted to ALD (table 2). These differences were similar when the clinical trials were divided between interventional and observational trials (data not shown). Finally, the relative number of scientific publications devoted to different types of liver diseases was analysed for the period 2010–2014. A total of 39 093 publications were found on the four main liver diseases included in our study. Published studies for HCV and HBV accounted for 46% and 32%, respectively (figure 1D). The publications for NAFLD were lower at 17%, and for ALD, even more so at 5%. Overall, the mean research attention afforded to the four main liver diseases was greater for HCV and HBV at 47% and 31%, respectively, than it was for NAFLD and ALD at 17% and 5%, respectively (figure 2). Calculation of mean research attention to the four major liver diseases. The mean research attention to the four main liver diseases (HBV, HCV, NAFLD and ALD) was calculated from five parameters: scientific publications (PubMed); research opportunities offered by public agencies in the USA and the EU; ongoing registered clinical trials (ClinicalTrials.gov); detailed analysis of all presentations at the two major annual scientific liver meetings (AASLD and EASL); and number of drugs in development in the pipeline of 38 major pharmaceutical companies. AASLD, American Association Study of Liver Diseases; ALD, alcoholic liver disease; EASL, European Association for the Study of the Liver; EU, European Union; HBV, hepatitis B virus; HCV, hepatitis C virus; NAFLD, non-alcoholic fatty liver disease. In the absence of systematic studies assessing the burden of the major liver disease worldwide, we next estimated the overall burden of the four major liver diseases by combining data from six different parameters (see methods). The relative numbers of mortality caused by liver disease in the USA can be attributed to 23% HCV, 0.54% to HBV, 3% to NAFLD and 50% to ALD.13 The indications of liver fibrosis in the USA were 10% to HCV, 7% to HBV, 48% to NAFLD and 35% to ALD.14 The causes of liver cirrhosis in the USA were 47% to HCV, 3% to HBV, 27% to NAFLD and 25% to ALD.15 The main indications of liver transplantation in the EU and the USA were attributed as 28% and 40% to HCV, 11% HBV (EU), in the USA there were no data on HBV due to its low indication rate for transplantation, 10% and 16% to NAFLD, and 39% and 23% to ALD.16 ,17 HCV and HBV contributed to $167 785 million (15%) and $52 062 (5%) of hospitalisation costs, while NAFLD and ALD contributed to $45 755 (4%) and $848 189 (76%), respectively, in the USA.18 The relative number of hospital admissions and discharges were obtained from Peery et al's18 calculation of the burden of gastrointestinal disease in the USA in 2012, and were attributed to the four aetiologies of liver disease: at 14 749 (17%) and 4568 (5%) to HCV and HBV, and at 2858 (3%) and 64 752 (74%) to NAFLD and ALD (see online supplementary table S4). Taking into account all these parameters, the mean disease burden was calculated at 28% and 5% for HCV and HBV, respectively, and 17% and 50% for NAFLD and ALD (figure 3). Estimation of mean disease burden to four main liver diseases. The mean disease burden to the four main liver diseases (HBV, HCV, NAFLD and ALD) was calculated from seven parameters: total number of US hospitals discharged, US hospitalisation costs, OLTY-EU, OLTY-US, cirrhosis-US, fibrosis and US mortality. ALD, alcoholic liver disease; HBV, hepatitis B virus; HCV, hepatitis C virus; NAFLD, non-alcoholic fatty liver disease. In order to critically analyse if there are disparities between the attention that the liver research community pays to the major liver disease and their burden, we generated ABI (if the relative attention equals the relative burden of a given liver disease, the ratio should be 1). The calculated ABI for hepatitis B and C revealed a +6.7-fold and +1.7-fold overattention, respectively. NAFLD received an ABI of −1.2-fold, reflecting its recent rise in attention within the field of hepatology, while ALD received a marked inadequate attention of −9.7-fold (figure 4 and table 3). The ABI indicates that while viral hepatitis has been extensively studied during the past years, ALD is being markedly overlooked. ABI for the four major liver diseases. ABI was calculated using the ratio of mean research attention (comprising different parameters shown in figure 1) to mean disease burden (comprising the parameters shown in figure 2) of the four main liver diseases. A value >1 reflects overattention compared with the disease burden, while a value <1 reflects inadequate attention. ABI, Attention-to-Burden Index ALD, alcoholic liver disease; HBV, hepatitis B virus; HCV, hepatitis C virus; NAFLD, non-alcoholic fatty liver disease. Correlation between the efficacy of current drug therapies for hepatitis and the mean research attention. (A) Current mean rate of efficacy for therapeutic drugs; (B) correlation between the efficacy of current drug therapies for hepatitis and the mean research attention. The efficacy of current drug therapies to treat chronic hepatitis (HCV), chronic hepatitis B (HBV), NASH and AH was calculated based on large published clinical trials (see Methods section). Definition criteria of drug efficacy for each of the four type of hepatitis were: HCV: sustained viral response at 12 weeks; HBV: achievement of end points suppressing viral replication; NASH: reduction in NAS or fibrosis score; AH: effect on short-term mortality rate. AH, alcoholic hepatitis; HBV, hepatitis B virus; HCV, hepatitis C virus; NAS, NAFLD Activity Score; NASH, non-alcoholic steatohepatitis. In the past decade, major advances have been achieved in the field of viral hepatitis, with the development of highly active oral antiviral therapies. In clear contrast, there are no approved therapies for NAFLD and ALD and interventions for AH are largely unchanged over the past 40+ years. We hypothesised that these discrepant advances are related to unequal allocation of research resources. Our systematic study found marked disparities between research attention and disease burden among the aetiologies of liver disease. We compared multiple modalities of hepatology research attention (eg, scientific meeting presentations, research funding, drugs under development, funding opportunities and publications) with measures of liver disease burden (prevalence, fibrosis and healthcare costs). We found a lack of correlation between research attention and disease burden. Overall, viral hepatitis received a 5–7-fold overattention, while alcoholic liver disease received a 10-fold underattention. There are a few similar studies in other fields of medicine that have investigated research attention and disease burden.47 Using a similar methodology to ours, these studies used clinicaltrials.gov, while others compared NIH funding to disease burden. Unfortunately, the discrepancy between funding and burden has become a common theme. The finding of attention–burden discordance is most likely multifactorial. HBV and HCV are causes of cirrhosis and hepatocellular carcinoma, and are important public health issues in their own right.1 ,2 Therapeutic targets for viral hepatitis are better defined than those for fatty liver diseases (eg, proteins regulating viral replication), and there is a significant interest to develop antiviral agents. It is important to recognise that the nature of these diseases also plays an important role in the development of drug therapies. The pathways of viral hepatitis (HBV and HCV) diseases have a significant positive effect on the advancement of effective drug therapies compared with that of fatty liver diseases. HBV and HCV have clear aetiologies, with transmission of the virus occurring in determined pathways which provide scientific researchers with clear targets for the development of pharmacotherapies. In contrast, fatty liver diseases (NAFLD and ALD) have multiple causes and are linked to other health conditions, their complex aetiologies, which necessitate the development of therapies that address multiple targets, and may contribute to the lack of drugs targeted to NAFLD or ALD. It is observed that increases in attention become self-perpetuating, with scientific advances (ie, drug development efforts, research allotment, etc) influencing greater research attention (more presentations, drugs, funding opportunities and publications) and vice versa. The inadequate attention especially to ALD is complex and includes the social stigma surrounding alcoholism, poorly defined targets for therapy, a lack of good animal models, few non-invasive markers of severity and poor general awareness of the diseases. Additionally, there is a lack of large-scale early detection efforts, and thus patients are often identified at very late stages of the disease. These challenges alongside patient identification, research and therapy result in a high burden of disease. Our findings should be viewed as a comparative assessment of relative attention and burden among the major liver diseases. While we completed an extensive search, which expanded over a 5-year period and involved multiple areas within both the public and private sectors, our estimates were derived from pre-existing databases with their own respective inclusion and exclusion criteria. Thus, limitations of this study include the possibility of incomplete estimates. Other limitations include the inability to complete a systematic review of the global burden of the major liver diseases due to the limited number of articles that focus on fatty liver disease burdens. The limited and heterogeneous resources used for burden estimates reflect the need for further research. Consequences of this large discrepancy among hepatitis and fatty liver diseases include extraordinary advances in the therapy of HCV and HBV prevention, while little advancements in early detection and treatment of ALD and NAFLD have been made. It is unknown if these differences impact mortality. The next decade could benefit from greater research attention being allocated to NAFLD and ALD. Translational studies identifying targets for therapy for fatty liver disease will certainly encourage pharmaceutical companies to invest in clinical trials. Ultimately, efforts by public funding agencies and the scientific community to address the diseases with the greatest public health burden will result in improved health outcomes for the greatest number of people. A striking finding of our study is the minimal attention that both public and private sources pay to ALD, which is the main cause of cirrhosis globally.4 In recent years, a concurrent increase in addiction behaviour and the prevalence of resulting illnesses such as ALD has been observed in the USA and Europe.5 ,6 Accompanying the sharp rise in ALD cases is the increasing burden of patients with liver disease on national health systems, identifying them as the main group expenditures in patient hospitalisation costs.18 In spite of its significant health and socioeconomic burden, few major advances have been made in the management of patients with ALD. The pharmacological therapies used today have not changed since 1971 (ie, prednisolone for AH), and no widespread early detection programmes have been developed.48 Our study should increase awareness in the public health agencies and academic institutions, especially in Europe, to devote more resources to face this prevalent and devastating liver disease. The development of a European Agency for Alcohol Studies, similar to the National Institute for Alcohol and Alcoholism (NIAAA) in the USA, seems a timely initiative.
. Global status report on alcohol and health 2014. World Health Organization, 2014.
. Pentoxifylline for the treatment of non-alcoholic steatohepatitis: a randomized controlled trial. Ann Hepatol 2011;10:277–86. Contributors NN participated in the collection and analysis of data on disease burden, efficacy of current pharmacological therapies, as well as in the interpretation of data, writing, critical revision and final approval of the manuscript. TGL participated in the collection of data from drug companies, ongoing clinical trials, as well as in the analysis of data and final approval of the manuscript. KJ participated in the collection of all data from major liver meetings (EASL and AASLD), analysis of data and final approval of the manuscript. JC participated in the statistical analysis, data presentation and interpretation, and the final approval of the manuscript. NV participated in the data collection and analysis of the published papers on each liver disease, and final approval of the manuscript. ASB participated in the conception and design of the work, and critical revision and final approval of the manuscript. RB participated in the conception and design of the work, data interpretation, drafting of the article and critical revision and final approval of the manuscript. Funding This work was supported by a grant from NIAAA (1U01AA021908). Data sharing statement Additional data are available by emailing the corresponding author at bataller@med.unc.edu.